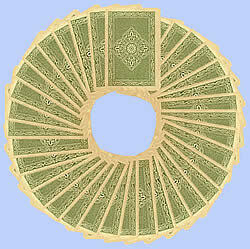 At the horoscope card oracle you will find all 36 Kipper cards, spread in form of a circle with the reverse side of the card. Try to relax and concentrate at this ring of cards. At one card, your view will stick a little longer. This card is your fortune card for the corresponding day.